Calmer, braver horses. That is something we all want right? Nobody likes to ride a horse that spooks at it’s own shadow, jumps at everything in the bushes and shies away from stepping over things that are unfamiliar. 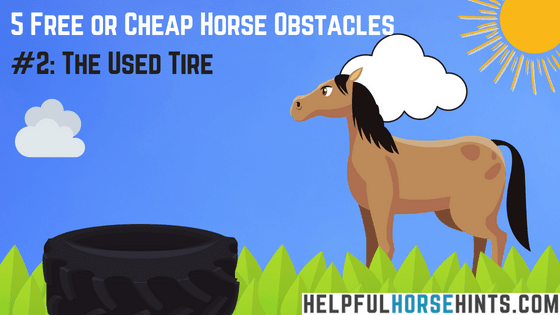 Obstacles are a great way to get your horse used to unfamiliar objects at home. Desensitizing your horse at home can help improve the way they handle new sights and sounds as they visit new trails, show ground or even just riding around a new friends arena. 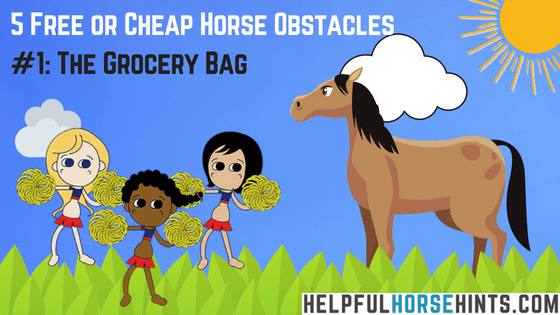 Each of these 5 ground obstacles can be obtained free or for less than $1 each. 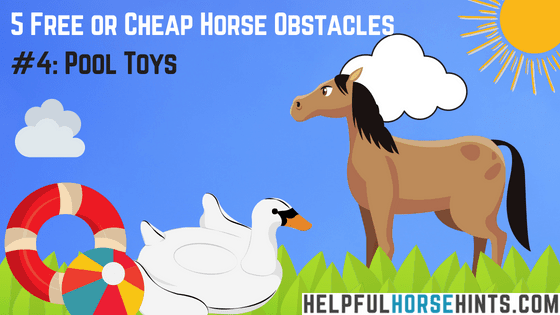 As with everything about horses, introducing your horse to new obstacles can be dangerous. If you are unfamiliar or even unsure, be sure to consult an equine professional for help! Rub your horse all over its body with the bag. Walk your horse up / near a railing with bags tied to it. Fill bags with sand and drop them around the arena using them like cones to walk your horse around as if they are cones. I don’t ever walk my horses over plastic bags, they could get caught on your horse which could be dangerous. Plastic bag dance…grab one or more plastic bags in hand and shake em like they are a pom pom. How creative can you get? Will your horse ground tie while you do the hokey pokey and shake it all around? Add a couple jumping jacks, get creative. Paper bags may be easier for some horses to accept than plastic bags. 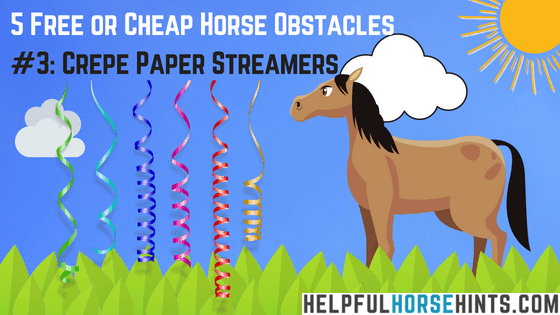 If your horse is really scared of plastic bags, try starting with paper! Try different materials of bags like white trash bags, black trash bags, etc. If the bag will hold air, fill it up and use a rubber band to tie it shut. Use as a ground obstacle (weighted down) or as a lightweight but now larger desensitization tool. Used tires can generally be picked up from your local tire shop for free, if you don’t already have one lying around. Stop by your local tire guy and tell him what you need and what it is for. Don’t let him talk you into paying for it. Tire companies have to PAY to get rid of used tires, most will let you take one off their hands as long as you promise not to bring it back! Where tires are concerned…bigger is usually better. Big tractor tires are a bit harder to find free so place an add in your local craigslist and see what you can find. Smaller tires from the tire shop can be arranged in a variety of different patterns. 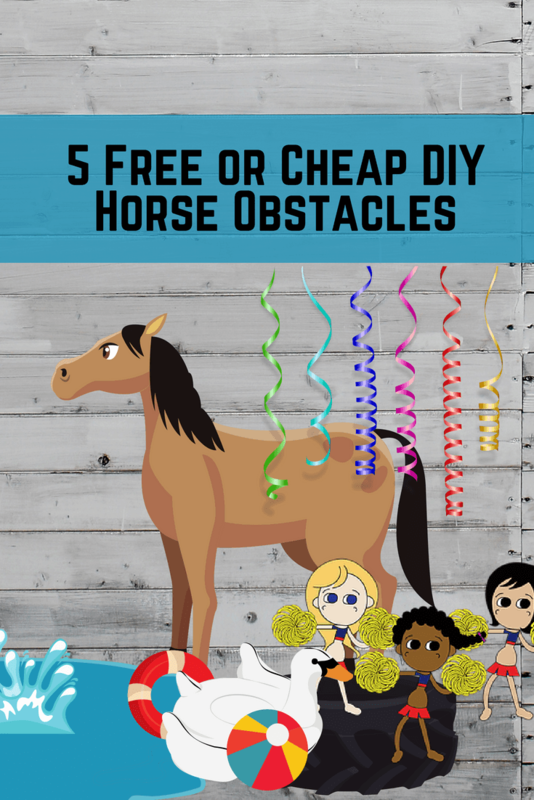 Check out our horse obstacle board on Pinterest for ideas! Fill it with dirt and use it as a step up / over obstacle. Be sure to fill it solid..you don’t want your horse to catch a hoof in the rim. Stand a few of them on end with half buried underground and use them as a back through or step over. Lay a few down under a thick, sturdy piece of plywood to “elevate” a bridge. Use long strips dangled from a barn aisle door way or gate panel to make a “car wash”. The paper rips away easily if caught. Tie a piece to the end of your horseman’s stick or lunge whip and use it to desensitize your horse. Remember to only throw it lightly…it can break. Tie or tape pieces to the arena railing and then see if you can get your horse to walk calmly by or even stand next to it. Much like our cheerleader example above…lets see your best “ribbon dance”! Can’t find them locally? You can get a pack on Amazon! Sack your horse out with them. Can you rub them all over with the pool toy? Lay them around the arena and use them like you would cones to maneuver your horse around them. Lay two side by side, will your horse walk between them? Hang them from the fence…what does your horse think about THAT? Your local dollar store should have some kind of selection. Want to ramp it up a bit? Invest a little more to get a larger toy with handles…Sharknado anyone? 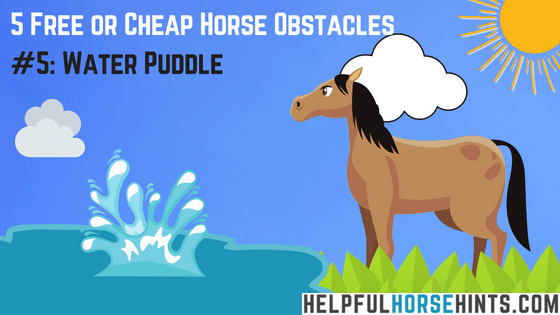 Depending on where you live and what time of year it is, it can be pretty difficult to find a decent water obstacle to school your horse on. The great news is that with a hose and a little bit of patience, you can create a puddle of your very own to school your horse with. Start small…need to clean out a water bucket? Did the dumping, scrubbing and rinsing leave a puddle? Before you fill the water bucket back up see if your horse will cross through the wet ground. Have several horses to train? Let the hose run a little longer to create a decent sized puddle to school all your horses through. If you do this in the morning in a pasture or turnout area during summer, your horses will appreciate the cool soil during the day as well! 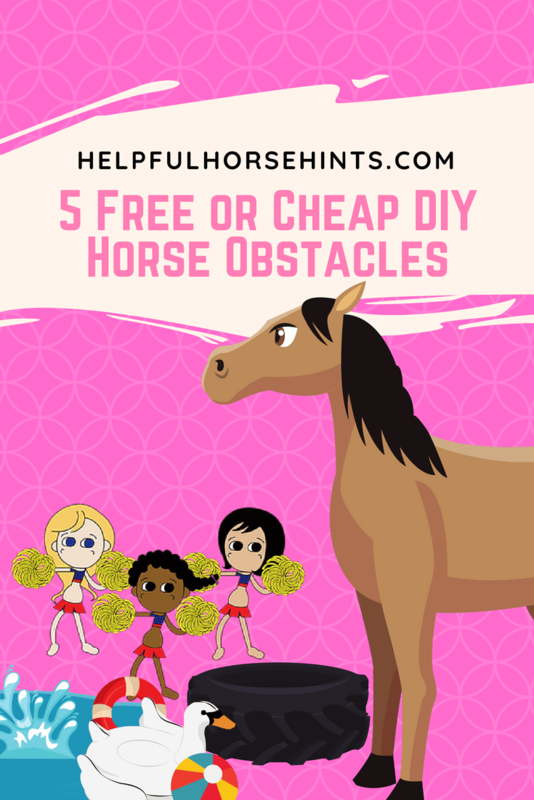 We hope you enjoyed this list of five cheap or free DIY horse obstacles. Remember when playing with your horses to think outside the box! Keep it safe, but make it challenging! Do you have any cheap or free articles you’d like to share? Use the comment box below!